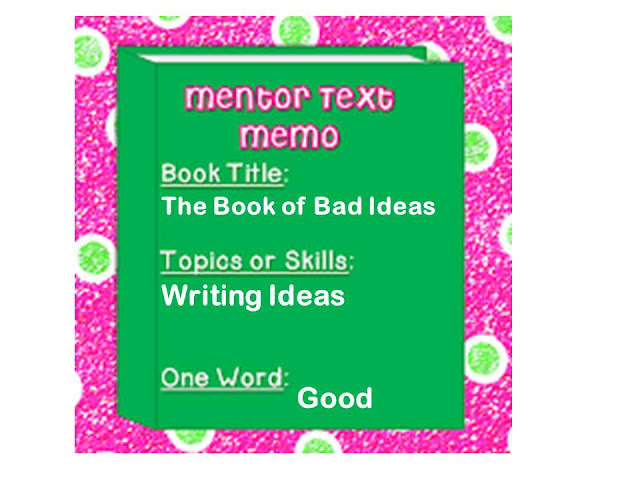 Mentor Text Linky, A Giveaway and a Sale! Woohoo! !I am finally on summer vacation! It feels like other teachers have been on summer vacation forever and it made the month of June seem extra long this year. I can't believe I am doing this, but I am linking up with the lovely ladies at Collaboration Cuties for their Mentor Text Linky - the theme, "Back to School" books. That's right I've only been out of school for two days and I am already thinking about BTS! (But I just couldn't miss this linky, I love it and these ladies too much). by Laura Huliska-Beith. Here is the description from Amazon. Have you ever done something and then thought "Uh-oh, that was a bad idea?" How about the time you asked your best friend to give you a haircut? Or, when you went roller-skating with your dog (who was just kicked out of obedience school)? Talented newcomer Laura Huliska-Beith has put all her ideas into one book: The Book of Bad Ideas -- a collection of laugh-out-loud scenes guaranteed to have readers eagerly recounting their own bad ideas. I think this is a fantastic book to use at the beginning of the year when launching Writer's Workshop and talking about ideas for writing. I love the illustrations and that the bad ideas are just randomly numbered. There are so many silly examples in this book it can be used to get students thinking about their own bad ideas or their own silly ideas. Either way it is a great way to get some ideas generated. I have also used this book as a Penpal book. 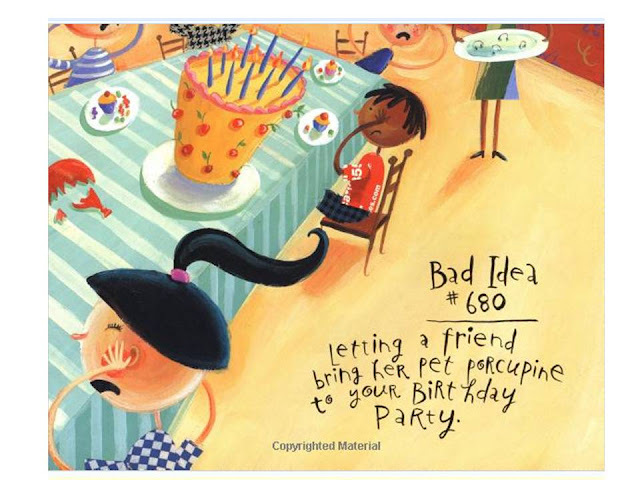 We read it as a class, make our own class book of Bad or Good Ideas then send both books on to our penpals - one of my favorite penpal activities. So while that is my official book suggestion I just happened to be book shopping with my end of the year gift - gift certificates and I bought this book and can't wait to use it the first day of school. I love Melanie Watt's books, I love Chester and Scaredy Squirrel!! 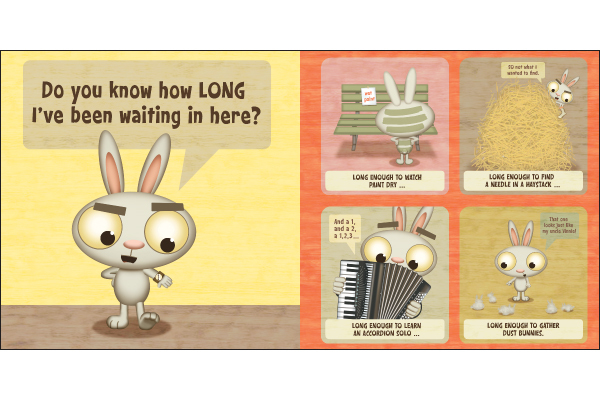 This book features this adorable rabbit who is waiting for someone and is so happy to have the person show up but also gives them a talking to about making them wait. I will use it on the first day to let me class know how I have been waiting all summer for them to come to my class and all the things I did to prepare for them. I will use it again later in the week to talk about the importance of being ready to learn and how hard it is for people to wait patiently. If you have not entered my Bloglovin giveaway (organized by the same lovely ladies hosting this party) please click here to enter. I will announce the winner tomorrow. I am also throwing a sale at my TpT store July 1st to July 4th. If you are in the mood to do a little back to school shopping check it out. Feel free to use the button if you want to throw a sale! I love how "Bad Ideas" lends itself well to having students start out writing at the beginning of the year. "You're Finally Here" is so cute for the beginning of the year too! It reminds me of how I swear students really do think we live at school! Awesome sale button! I think I might just grab it and host a sale too:) Thanks! I've never heard of Bad Ideas, but onto the shopping list it goes! LOVE the ideas!! Both of these books are new to me. I just added them to my shopping cart. They look fantastic. My students love Scaredy Squirrel so I look forward to sharing another book like it! Thanks for the suggestions. I love Bad Ideas!!! I use it for writing too! We make a class book-it's a fun and easy beginning of the year writing activity! You're Finally Here is new to me-adding to wish list! Thanks for sharing! 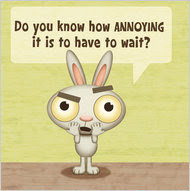 I am adding Bad Ideas to my Amazon cart right now!! That looks like an adorable book and a sure fire way to get kiddos writing! Thanks for sharing! 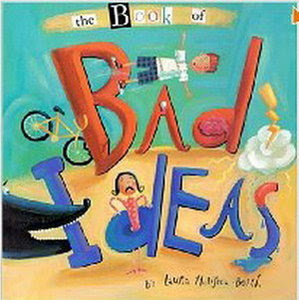 The Book of Bad Ideas sounds like a great idea to add to my class library. I have never saw it, but I think it and the class book activity would work great even with my firsties. I do have You're Finally Here and it is a crowd pleaser. Great for the first day. Thanks for sharing. I'm pinning right now. Oh, I love the idea of Bad Ideas!! What a great book to use at the beginning of the year!!! 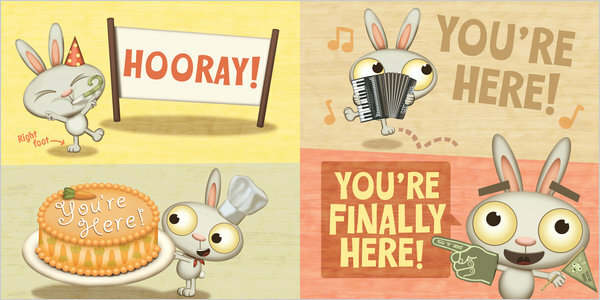 And, I love Scaredy Squirrel (that the unit I'm working on now) and the book You're Finally Here looks adorable!!!! So sweet!! Thank you for linking up my friend! I can't wait to talk to you more often! I love your blog! I'm going to add the book of Bad Ideas to my Amazon wishlist. I think I may have pinned it awhile back but you brought it back into my mind! I think that would be a great book even at the 5th grade level to really launch into writing workshop.